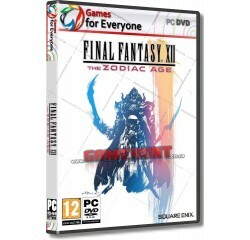 Final Fantasy XII - The Zodiac Age - R240,00 : Game Hunt, Where we lead, others follow. RETURN TO THE WORLD OF IVALICE - Enter an era of war within the world of Ivalice. The small kingdom of Dalmasca, conquered by the Archadian Empire, is left in ruin and uncertainty. Princess Ashe, the one and only heir to the throne, devotes herself to the resistance to liberate her country. 60 FPS - Ivalice will look even more spectacular running at 60FPS. Compatible with 21:9 ultra wide monitors. New Game Plus and New Game Minus. Maximized License Points and Gil. Processor - entium G3260 @ 3.0GHz (2 cores)® or equivalent AMD® processor.